Tube complement: 12SA7 mixer/oscillator, 12SK7 IF amplifier, 12SQ7 detector, 35L6GT audio output, 35Z5GT rectifier. Tube complement: 12SA7GT mixer/oscillator, 12SK7GT IF amplifier, 12SQ7GT detector, 50L6GT audio output, 35Z5GT rectifier. These small radios were both made by Belmont, one just before WWII, one just after. Other than the slight updating of the tube complement, the color scheme of the dial, and the superficial brand name, they are identical. Approximately 8-1/2 inches / 216 mm wide. 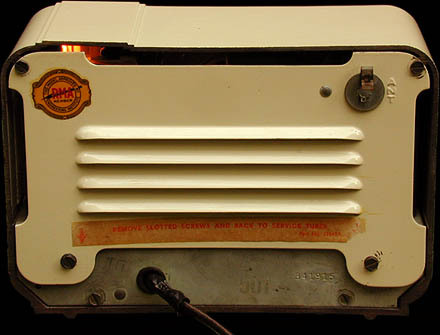 This back view of the Grantline 501 shows its plate antenna. 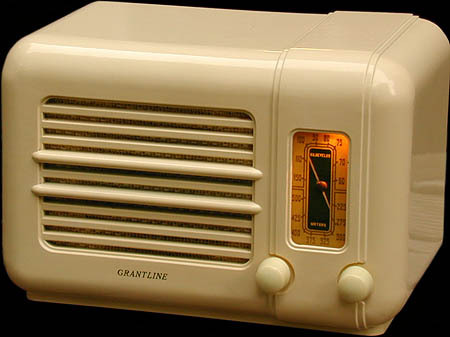 It's a less efficient (and cheaper) alternative to the built-in loop, and is used on "low-end," local-reception-only radios.